With cash corn fetching a measly $2.85/bushel in our area early this winter, every percentage point of moisture that needs to be removed from the crop has a financial impact equivalent to a yield loss of about 1.75%. Seed selection season is here again for corn farmers across the United States. Yield potential is often the key consideration in this process, whether through the selection of ‘racehorse’, ‘stable’ or ‘workhorse’ varieties, or the selection of specific genetic traits that will mitigate the headwinds the crop might face in any particular field. With today’s depressed commodity prices, however, one additional consideration should be playing a prominent role in this decision process: expected moisture at harvest time. In eastern North Dakota, where I farm with my brother, the charge for drying corn at our local elevators is typically $0.05 per percentage point of moisture, per bushel. With cash corn fetching a measly $2.85/bushel in our area early this winter, every percentage point of moisture that needs to be removed from the crop has a financial impact equivalent to a yield loss of about 1.75%. Unfortunately for us, the approaching winter season typically forces corn to be harvested at moisture contents of 20% or more, making it frustratingly easy to give away 10% or more of the value of the crop just to get it dried down to market standards. Given that the difference between the best- and worst-performing seed varieties in test plots is often in this same general range, the expected harvest moisture should clearly be a factor in next year’s seed selection process. Historically, expected crop moisture has not been an easy factor to account for. Drydown characteristics are not directly comparable across seed companies, and the importance of the stated drydown characteristics on the ultimate harvest moisture content depends heavily on weather conditions during the fall. With good drying weather, most varieties tend to dry at a similar rate. The drydown characteristics begin to matter much more when conditions in the fall are unfavorable for in-field drying. Unfortunately we are not to a point where weather conditions can be predicted 9-12 months in advance with any reliability. The good news is that accounting for crop moisture in seed selection may be getting easier. Over the past year, I have been involved in a great deal of research into the predictability of corn moisture content at substantial lead times before harvest. This research has largely relied upon the Farmers’ Independent Research of Seed Technologies (F.I.R.S.T.) test plot data, which was graciously shared with us in a bulk form that was conducive to large-scale data analysis. In the process of experimenting with models for predicting corn moisture content at harvest, an unexpected result emerged: errors in the predicted harvest moisture content were generally diminishing year by year over the time span of the dataset (2008-2016). Why would this be? Though it may not explain this pattern completely, an interesting observation about the F.I.R.S.T. dataset may point us in the direction of the answer: there is increasing moisture uniformity across both hybrids and seed companies for similarly labeled relative maturity (RM) ratings. As evidenced in Figure 1 (above), the mean moisture content variability (as measured by the standard deviation) of hybrids within a given test plot, for a given RM, has decreased from 1.31% in 2008 to 0.64% in 2016. 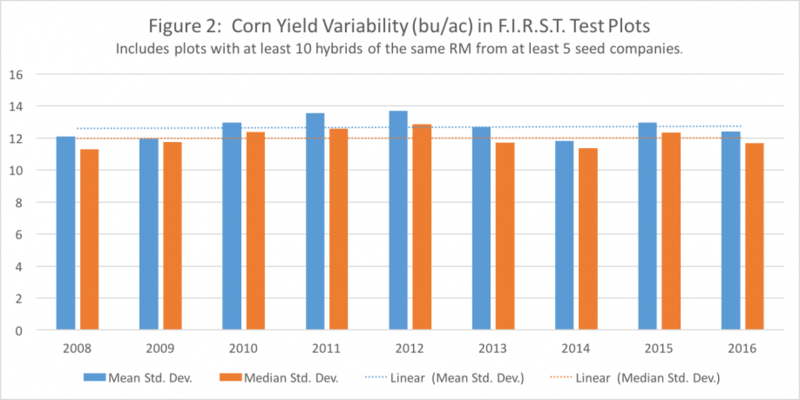 For comparison, there has been no discernible trend in yield variability of hybrids within a given test plot, for a given RM, over this same period of time (see Figure 2, below). The exact language of this statute has changed since it initially appeared many years ago, specifically tightening up the requirement that a labeled RM must be within three days of reality as determined by comparative trials. For reference, the industry’s most commonly used method for assigning RM ratings assumes a field drying rate of 0.5%/day, such that one percentage point of difference in harvest moisture content in comparative trials equates to two days of difference in the resulting RM rating. 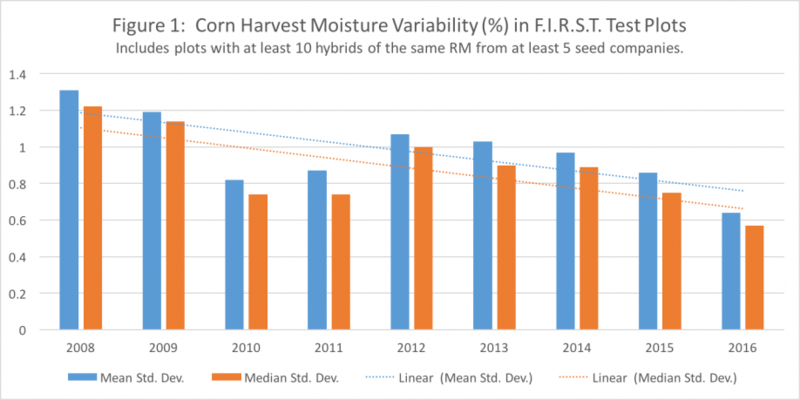 While the impact of this statute relative to other possible factors that may be driving this trend is unknown, the significance of the underlying trend is still clear: now more than ever, you can count on different hybrids of the same RM rating exhibiting reasonably similar harvest moisture contents, regardless of the seed company or specific hybrid selected. You may want to keep this in mind if you’re thrown a seed sales pitch regarding a particular hybrid drying down much faster than a competitor of the same RM. You may also benefit from doing your own comparison of the yield advantage of longer season hybrids vs. the additional drying costs that will typically come along with them. While the relationship between RM and yield varies both across the country, and as a function of where in the RM spectrum you generally land, a rough approximation of a 1% yield difference for each day of relative maturity change seems to be a ballpark approximation for much of the northwestern corn belt. So, if you aim to increase your yield by 2% by selecting a hybrid with a two-day longer RM, but then add 1% to your corn moisture content at harvest (and, recalling from above that this 1% moisture difference is roughly equivalent to a 1.75% yield loss at current corn prices and drying costs), are you really gaining anything? Maybe chasing higher yields by growing longer-season hybrids is counter-productive in the present price environment? It may pay to do the math for your own situation in order to find out. Dr. Mewes serves as Chief Scientist at Iteris and manages many of the R&D activities associated with Iteris' ClearAg offerings. John holds a B.S. in Atmospheric Sciences from the University of North Dakota (1994), and both an M.S. (1997) and Ph.D. (2001) in Meteorology from the University of Oklahoma. He is a past recipient of the Douglas K. Lilly Award for Best Ph.D. Manuscript at the University of Oklahoma, as well as a past recipient of both the American Meteorological Society’s Undergraduate Scholarship and Graduate Fellowship. In his roles at Iteris, Dr. Mewes has headed many research and development efforts at the company to include weather analysis and forecasting systems, techniques for remote-estimation of field-level weather, soil and crop growth models, and associated tools for supporting crop production decisions at all stages. 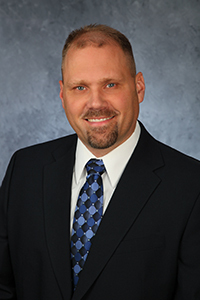 He has previously held part-time appointments with the University of North Dakota Department of Atmospheric Sciences, including land surface modeling work performed for the Army High Performance Computing Research Center. Dr. Mewes also farms with his brother in eastern North Dakota, growing edible beans, corn, soybeans, sunflowers, and small grains, both conventionally and organically.